Looking back on my emails, I realized that on this date four years ago Reilly and Ryan came into my life. The date is doubly important because it’s also my father’s birthday and he is turning 90 today! I had intended this site to document their lives, but for one reason or another it didn’t work out that way. Not sure if that will change going forward, but I wanted to mark the occasion here regardless. They’ve grown up so much in the last four years. They each have very distinct personalities. Reilly is somewhat aloof, but if you get her in the right mood she responds very affectionately to rubs under the chin and behind her ear. And we’ve also developed an odd ritual of brushing. There are times when she lets me brush her while she’s on top of the bookcase. However, her favorite method is for me to follow her around grooming her as she rubs against one corner and then another or up against most any object in her path. As a kitten, she had difficulties adapting to the litter box. While it looked for a while like that was in the past, shortly after our move back to Boston she returned to her old habits. Fortunately, aside from a couple of early incidents, she’s ok with using the box to pee in. It’s just when it comes to poo that she prefers the space beside the box. We’ve tried a number of things to get her back into the box, but finally resigned ourselves to the fact that she’s not going to change – and it’s a whole lot easier to clean up poo from beside the box rather than pee. Ryan continues to be my lovable goofball. Lorraine gave the cats a bunch of foil balls for Christmas and they quickly became Ryan’s favorite toys. Reilly will play with them on occasion, but she’s above all that chasing around for a piece of foil. Ryan on the other hand will start patting these things around the house at all hours. He will gladly smash into walls in order to catch his prey. But Ryan also has his challenging side. As a kitten, he had an unfortunate experience at the vet when being treated for a ripped out nail. The dreaded cone of shame was too tight and the bandage on his paw was decidedly unpopular with him. That was the first time we experienced what I call Exorcist Ryan. He made noises that would be perfectly at home coming out of the possessed child in that movie. That Ryan arose again during the move and comes out (albeit in abated form) whenever Reilly gets back from a mani pedi at the vet. I feel bad for the poor guy, but he’s also a bit difficult to handle at these time so I’m glad when they pass. The two cats have adapted well to life in the suburbs. They have a staff of three waiting on them each day – complete with posted feeding schedules so no meal goes unfed. They are much closer to the wildlife here. The picture window provides a great view of the local bird and squirrel population, to say nothing of the occasional kid passing by. Unfortunately, their love affair with the steps waned after a while. I was hoping it would be a great source of exercise for them, but nowadays they don’t go charging up the stairs every time someone heads upstairs. Of course if they thought they had a chance of sneaking into Dad’s room that might just be the incentive they need to get racing up there again. So all in all it’s been a remarkable four years. I’ve gone from a person who never had a pet and who was afraid of cats to someone who feels something is off if she doesn’t have a big, somewhat dopey cat beside her at night (I’m sure you can guess which one sleeps with me). I want to thank Cecile and all the folks at Bronx Tails for bringing these bundles of joy into my life. I can’t imagine not having them here with me. But one of my New Year’s resolutions is to be better at updating this site. Tonight I just have time for a quick post, but I’ll be going back through some of the images I have to add. Here are two from this morning which help explain why it’s so hard to get out of bed in the morning. Wouldn’t you stay in bed if you have these two lovely companions? As I mentioned last time, the three of us packed up (with my sister Lorraine’s help) and moved to Massachusetts back in March. It turned out to be a bit of a traumatic move. We put the cats in the bathroom when the movers were there, but that wasn’t enough to block out the sound of the tape that the movers used. Hours and tens of rolls of tape later, Ryan was completely stressed out. Took a lot of effort to get him into the cat carrier. The drive home didn’t help. By the time we got most of my stuff in the storage unit and the rest in the house, he was a very unhappy cat. Hissing and snarling at everyone. So we put a litter box in my bedroom along with some food and a blanket from the old place. Reilly and I slept in the other room for three nights before he was back to his old self. They’ve both adapted quite well to living in a house rather than an apartment. They got to experience stairs for the first time. They love stairs, and the fact that there are closed rooms at the top that they might be able to sneak into only increases the joy. Whenever anyone goes upstairs, they follow behind just in case. We’ve had to institute a few new rules in the house. No more leaving chairs pulled out at the kitchen table. If you forget that rule, Ryan and Reilly will definitely be on top of the table exploring – and potentially stealing pens, eyeglasses, etc. We also have to be more careful with the doors to outside and the basement. I’m more worried about them getting out than getting downstairs, but there are lots of ways for them to get in trouble in the basement so they haven’t been allowed down there. They’ve taken over the living room and spend their nights out there with my Dad. Ryan loves Dad’s leather chair and Dad often doesn’t have the heart to shoo him off (he’s a real softie). 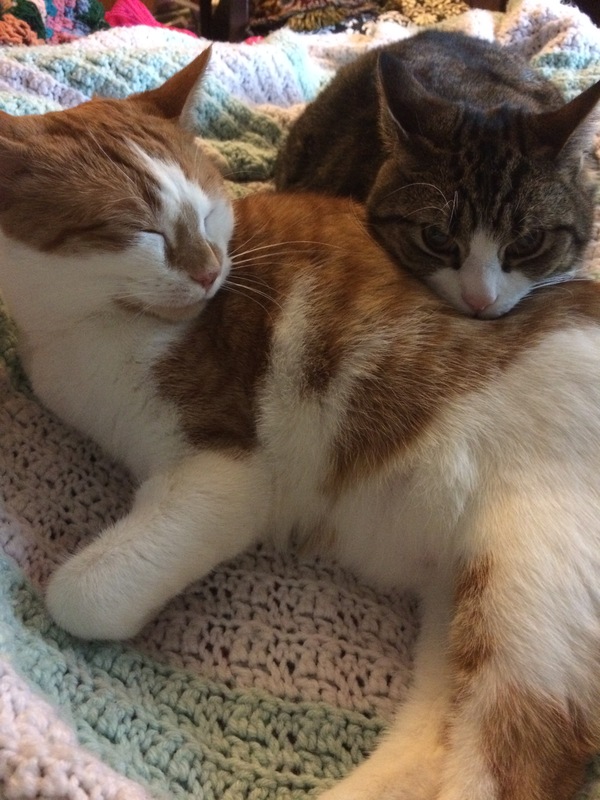 I get them first thing in the morning – in large part due to the fact that they want to be fed. 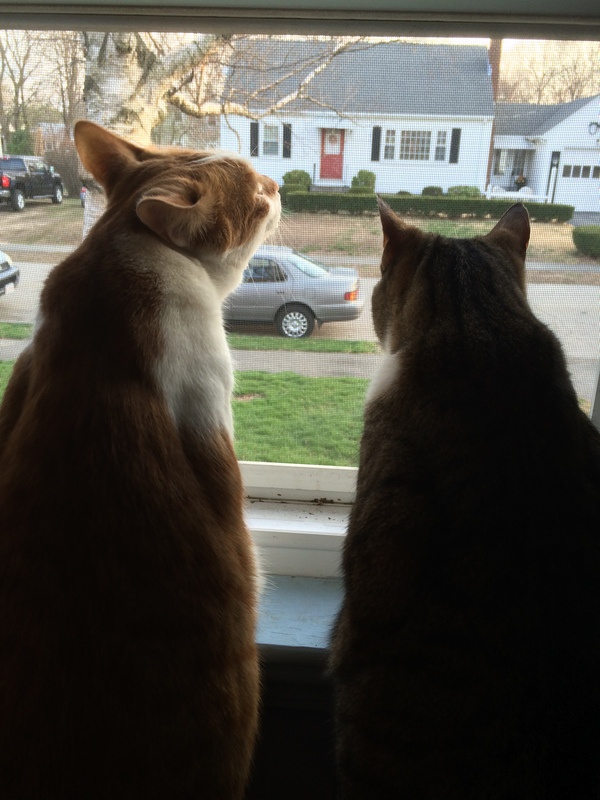 Otherwise their days are spent looking at the birds, squirrels, and kids out front. They are quite content.